Graduating senior Eric Adams receives congratulations from his mother, Cassandra, who serves on the Cumberland School of Law faculty. Samford University celebrated several historic milestones during spring commencement activities, including the largest graduating class in the university’s 176-year history. A record 1,240 degrees were awarded, although the official total will not be available until all grades have been submitted and graduates certified, according to university officials. That tops the 2017 record of 1,165. An estimated 250 students graduated with honors. 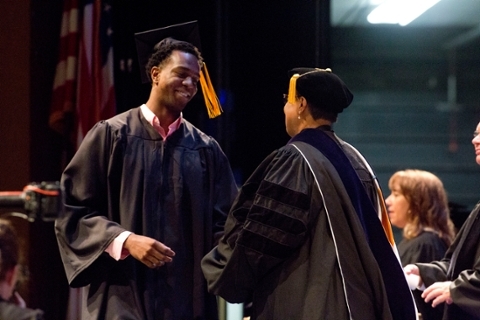 In the seven commencement ceremonies, 33 different degree programs were recognized, including the first graduates in the Doctor of Physical Therapy, Master of Athletic Training, Master of Science in Respiratory Care, Master of Science in Health Informatics and Bachelor of Science in healthcare administration programs in the College of Health Sciences. In the most unique commencement address, art professor emeritus Lowell Vann used his talents in chalk drawing to inspire graduates in the schools of the arts and education. Other commencement speakers included students who were graduating in health sciences, a pastor, a banking executive, an attorney and a federal judge. Several are Samford alumni. Mary Katherine Stanley, a University Fellow and accounting major from Memphis, Tennessee, received the President’s Cup, awarded to the graduating student with the highest undergraduate grade point average (GPA) across all Samford colleges and schools. She was one of five students to receive prestigious honors during commencement ceremonies. Sarah Michelle Duke was commissioned as a second lieutenant in the U.S. Air Force and received a standing ovation from her fellow graduates and the audience at the Howard College of Arts and Sciences ceremony. A record live stream audience watched ceremonies in seven countries: Korea, Australia, Chile, England, Philippines, Germany and the U.S.